What do you get when you combine vodka with pineapple juice, amaretto, and grenadine? 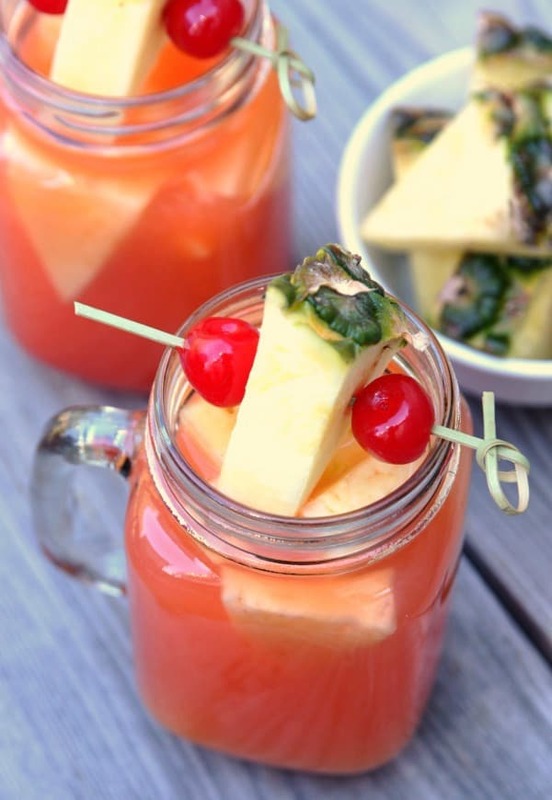 A delicious Pineapple Upside Down Cake in a Glass. This is my kind of drink! And you know what? Some days you just have to drink your dessert and it’s perfectly okay. In fact, days that end with a delicious cocktail are the best! Saturday night we had game night at our house. 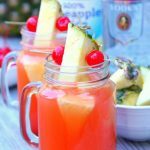 We played Catch Phrase and whipped up a few Pineapple Upside Down Cake Cocktails. Not only are they delicious but they don’t require a lot of ingredients. I’ve come across many mixed drinks that I want to make but I don’t want to buy 5 different liquors just to make one drink. That’s one more reason to love this drink – only 4 ingredients! 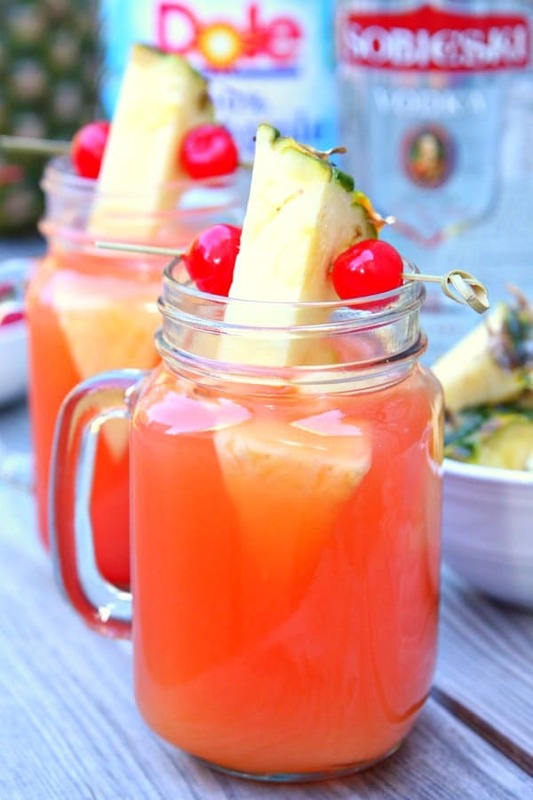 So, are you suddenly craving a Pineapple Upside Down Cake Cocktail? First, you need to gather your ingredients. 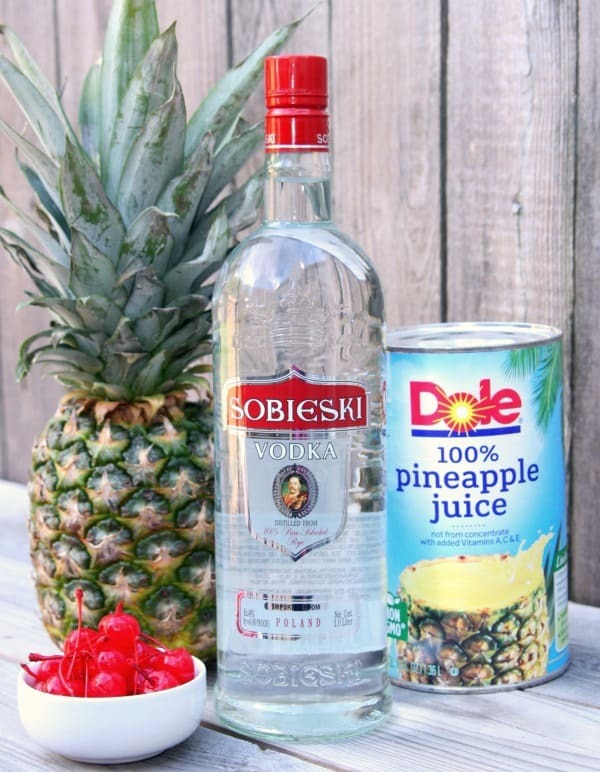 I started with DOLE® Canned 100% Pineapple Juice and a bottle of a bottle of SOBIESKI® 100% Pure Rye Vodka. 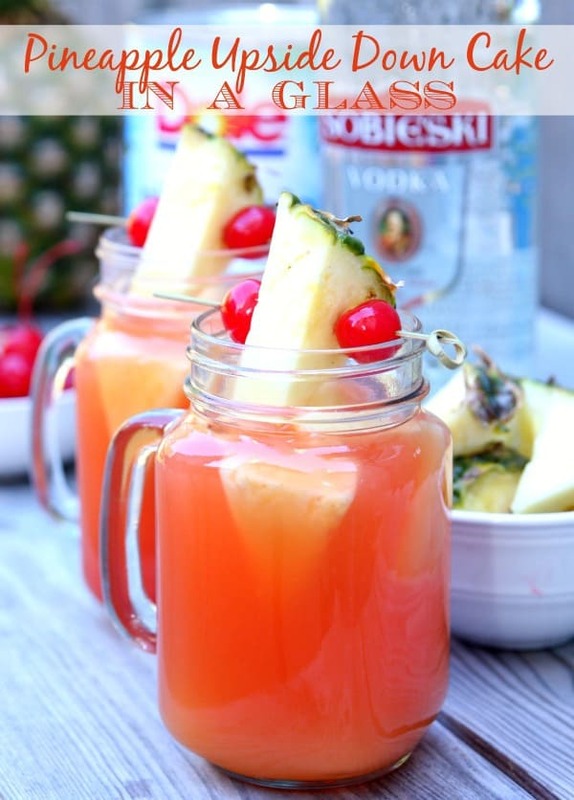 Hubby loves SOBIESKI® Vodka so he was excited to try this drink with me. Add a splash of Amaretto and grenadine, then garnish with pineapple and cherries for the perfect dessert cocktail. And the best part – add frozen pineapple. Why would you want to add ice to a delicious drink when all it’s going to do is water it down? Keep frozen fruit in your freezer to cool off your cocktails instead. I’m not a big fan of ice to begin with so adding frozen pineapple to this drink was just what it needed to stay cool. Now it’s time to sit back and enjoy a Pineapple Upside Down Cake in a pretty glass while I watch This is Us. Have you watched the first two episodes yet? We are hooked! It’s our favorite new show to watch. Add frozen pineapple chunks to glass. Pour vodka and pineapple juice over pineapple chunks. Add amaretto and grenadine. Stir ingredients with spoon. Making this recipe? Share it with us on Instagram using the hashtag #happy_go_lucky so we can see what your making in your kitchen. Click here for more delicious cocktail recipes. Click here for all our favorite recipes.